Quarter two medium-sized tomatoes and place the pieces on a baking dish. Coat with olive oil and minced garlic, sprinkle salt and pepper and roast in an oven at 450°F for 20 minutes. 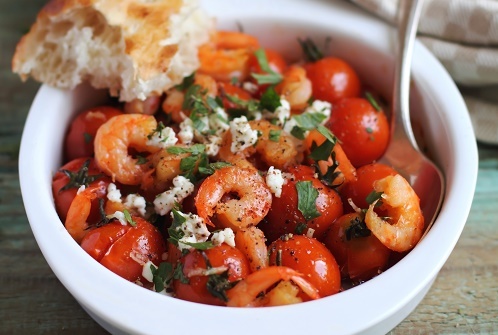 When it’s done, sprinkle the tomatoes with peeled and deveined shrimp, chopped parsley, lemon juice, crumbled feta cheese, salt and pepper.